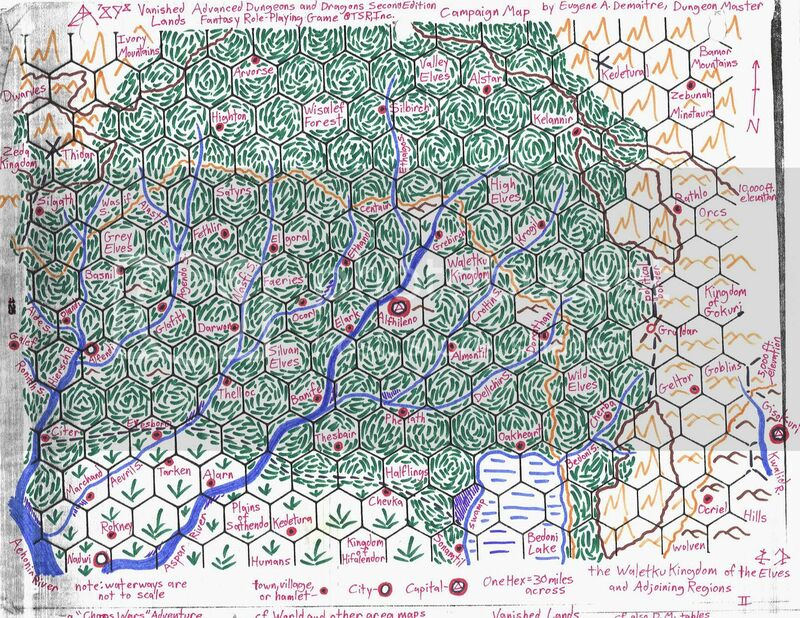 Fellow role-players, here is my update for Session T3.35 of the latest adventuring party in my “Vanished Lands” heroic fantasy campaign setting. The teleconferencing team met on Sunday, 13 November 2011, and has been using Pathfinder, Skype, and an online dice roller. After meeting in the Wisalef Forest, an unlikely band of adventurers encountered the hostile Centaur followers of Vappu Lahja on the Plains of Sathendo…. >>”2 to 5 November 1229 B.C.E. :” Upon emerging from the barrow of a talking unicorn and Sidhe, the trio of Asish, Jovinda, and Kazuo found that nearly two months had passed. They visited the border village of Tarken to learn the whereabouts of their traveling companions and steeds, as well as the fanatical followers of the mysterious Vappu Lahja…. Asish rises shortly after dawn, little the worse for wear after drinking too much cider the night before. The Ranger finds Jovinda praying and Kazuo meditating outside the “Charging Cow” inn. After breakfast, Halfling innkeeper Dwight directs Asish to the Hollysharp pipeweed farm. Jovinda and Kazuo talk with Holsaf Silbirch and Charon Galacticus [Carlos R./Non-Player Character], two Sylvan (Wood) Elves, to ask about their onetime traveling companions. Holsaf, an arcanist with a bejeweled longsword, says he is visiting colleague Charon, who carries scrolls and a longbow. The latter Elf recalls meeting Digger, Kovar, and Gawain a few weeks ago [in “game time”]. Holsaf is visiting from Evesboro, which he says has been relatively quiet since the Orcs and Drow of Zuromm turned their attention south, to the human kingdom of Saganim. Unaccustomed to hiking on foot, Asish makes his way to the farm of Digger’s family. The Tsucharim human finds industrious Faldine Halflings processing pipeweed for shipment. In one low-ceilinged hall, Asish meets Jamian, Digger’s eldest brother. The brusque merchant accepts a gift of dried tea leaves and complains that Davven would rather wander than stay at the academy in Alfendi or work in the family business. Jamian admits to trading harsh words with his brother when he last visited, and he believes that the scholar and his retinue headed north, toward the Elven city of Alfendi, after looking for Asish. Serious Holsaf and flirtatious Charon express some interest in trading and studying enchanted items, which Jovinda hopes to trade in exchange for cash for replacement steeds. Monk Kazuo wants for few provisions, but Cleric Jovinda is curious about the party of “Jade” [Sammy/N.P.C.] and notes that paying missions would be nice. Asish asks for help acquiring travel rations and horses, so Jamian directs him to another brother, Panros, whom he had met previously. After some haggling, Panros sells Asish two riding horses and a mule with harness, tack, and feed for 292 crowns (gold pieces). The scout agrees to collect them the next morning and to not tell Jamian about any bargains. Meanwhile, Jovinda and Kazuo go to a stable at the edge of the village to offer their services. The priestess of Mekkil, goddess of nature, asks ostler Gothard if any stray animals have been found in the past month or so. The wiry human says that some peasants found a horse wandering several weeks ago. Jovinda is delighted to be reunited with Wyth-Amoi (“Wind Spirit”), and she and Kazuo agree to tend to injured or sick animals for 40 crowns. The Nezumi later tells Asish of their good fortune, and the scout is determined to find his own horse and dog again. Gothard recovers Jovinda’s saddle and clothing, which she had also thought lost, from the farmers. Asish sells a magical dagger to Charon and decides to still get two horses even though Jovinda has recovered Wyth-Amoi and Kazuo has no interest (or skill) in riding. The next day, Asish, Jovinda, and Kazuo head north, following the Aevril Stream and a map of Ley lines. Kazuo’s keen nose detects that a dog has recently marked trees at the edge of the wide Wisalef Forest. Asish is excited to find tracks of a horse, presumably Onimusha, and a dog, likely Genghis, and he presses on. The Tsucharim rider soon detects another set of footprints, belonging to a creature he can’t identify. The trio hears barking and runs to see Onimusha and Genghis raggedly defending themselves against a large monster with canine hindquarters, long forelimbs ending in grasping claws, and a head that resembles a steaming rabbit skull! Angry Asish draws his bow, wise Jovinda invokes her patron Mekkil, and nimble Kazuo maneuvers around…. Posted on November 15, 2011 by GeneD5Posted in Fantasy & Steampunk, Games, Vanished LandsTagged pathfinder, rpg, skype, telecom team.